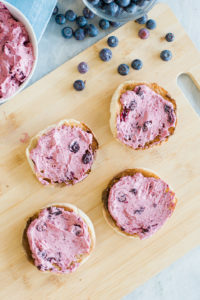 This Blueberry Spread is so quick and easy to put together. Spread it on an English muffin for a great breakfast on the go! Bring 1/2 cup blueberries, 2 Tablespoons water and 1 Tablespoon packed brown sugar to a boil. Reduce heat and simmer until blueberries have popped and a sauce has formed, about 5 minutes, stirring occasionally. Remove from heat and allow to fully cool at least to room temperature (this is very important). Mix blueberry sauce together with ½ cup Brummel and Brown Spread until blended. Spread on English muffins.